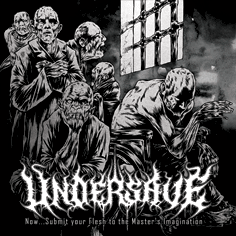 An album title and intro that evokes images of Montag The Magnificent from The Wizard Of Gore, Undersave‘s debut is suitably splattery like Mexigorge‘s Chronic Corpora Infest, brutal like Embalmer‘s There Was Blood Everywhere, and twisted like Mortal Decay‘s Forensic. Like a solitary string in vibration, disturbed from its path of oscillation by strategically advised interference from outside, a component of Undersave‘s riffing relies on melodic blooms atop a consistently undulating bass string. This technique is akin to speed metal’s chug-and-stab, but the writing here, and the band’s influences in general, is far more wide-ranging; in addition to the sore-ridden underbelly of the bands already mentioned, certain tech-death mannerisms – primarily, the rapid turnover of notes under a suggestive melodic space – also make their presence felt. However, unlike the self-obsessed soliloquy of the many nameless tech-death bands out there, this hyperactivity takes place under something resembling the call-response aesthetic of more traditional death metal, a feature of the writing that keeps songs from flying entirely off the handle. Like the underrated Prosanctus Inferi, Undersave excel at writing broken motifs, long-chained riffs, and delayed pay-offs. A broken motif is a previously expressed “whole” melodic notion which at a later date in the body of the song reappears but as broken into shards, the space between which shards is occupied with flurries of noncommittal activity. Long-chained riffs involve phrases that keep building and building, often encountering multiple junctures where they seem on the verge of imploding, but are somehow kept progressing until their eventual climax. A delayed pay-off is subjective by nature; it is the product of the two prior concepts, and usually occurs as a real “event” when both hands have been revealed, when the listener begins to grasp the bigger picture. Interesting ideas, all, which are far too rarely utilized by death metal bands. Admittedly, they require just the right knowledge of theme, sound, and modus operandi of previous genre strains. Undersave showcase these facets in fine balance on this forgotten album. This entry was posted in Death Metal and tagged death metal, no submit to the master's imagination, portugal, undersave. Bookmark the permalink.